Living in London can be exhausting and the last thing on your mind during weekends id to clean and scrub, and dust. Alas, it is inevitable, you do need to have a clean home in order to have a healthy body. But how to tidy the house without wasting all day in the company of the vacuum machine? Our professional cleaners decide to combine forces and help all those unfortunate soles that are tired of spending all their energy on cleaning. Hopefully, the following advice will brighten your day and your home. You don’t need to clean every room one by one. There are different things that you can do in each one. When you work with strong cleaners, they usually need to sit for a couple of minutes. Use this time wisely. Pour the toilet cleaner and let it do its magic while you are placing new bed sheets or doing the laundry. If you have children make a small list of two-three things, they are obligated to do every weekend like tidy their own room and do the dishes. Same goes for your spouse – taking out the trash or going grocery shopping. Use your time wisely. You want to clean quick and efficient, so you need to ban all the distraction. No phones or telly while cleaning. You can play music or listen to an audiobook if you want, but you need to be concentrated primarily on your work. Buy a squeegee. This magical cleaning tool is not used only to make your windows shiny. It can remove fibres and pet hairs from carpets and upholstery. The squeegee is your best friend when it comes to cleaning and drying the tiles in the toilet. Using DIY cleaners is not always safe for the surfaces you are cleaning. In the past few years, it became very trendy to use vinegar and baking soda to clean practically everything in the home. However, before using them you must consider the type of the surface you are going to clean. 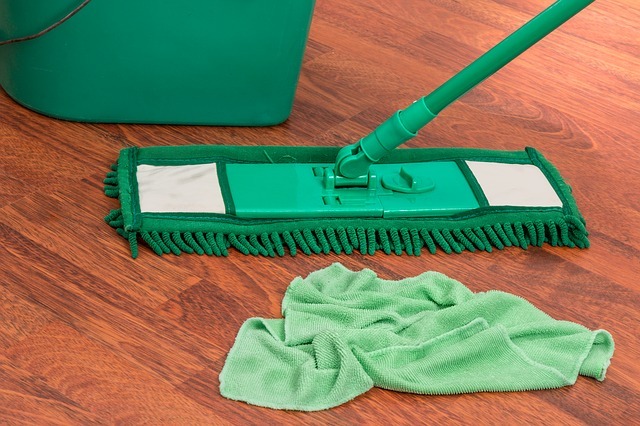 For example, if you use vinegar to clean your wooden floor, this will damage the floor’s coating. Cleaning can be dangerous. Most cleaning detergents consist of chemicals that are harmful to the human body. Always clean with gloves. Ammonia and chlorine must not be mix ever, period. If these two chemicals get in contact with one and other, they create a deadly reaction and a poisonous vapour is released into the air. If you can, avoid cleaning with detergents that contain one or the other. Incredible as it may sound there are a few house cleaning rules that need to be followed strictly in order to do your job good. London is a highly populated city and here you have homes of every shape and size. These professional cleaning rules are universal and can be applied to every type of building. Start from the highest place in the room and work your way down so you won’t spread dust and dirt on the already cleaned places. Always begin from the room that you use the least. The places with big foot traffic will need more attention so leave them last. Never clean windows on a sunny day. The sunlight will reflect on the glass surface, and you won’t be able to see all the spots and smudges. Also, you don’t need to clean your windows every week. Once a month is enough. You will need to clean your hallways and staircases two times. Give them a quick swipe before you start and then in the end. Take care of your body. You don’t need to push yourself to clean every inch of the home. Take it easy and try to avoid bending or squatting as much as possible.